Kings Cross Nando's will play host to #RYN9 and we can't wait to celebrate our ninth birthday with you! Nandos: A PERi-PERi Big Success Story is on Channel 5 on Thursday 5 July at 9pm and we can't wait! Read more about Nando's heading to Greenford? Nando's to open on Waterloo Street in Glasgow City Centre! Read more about Nando's to open on Waterloo Street in Glasgow City Centre! Nando's to open in Sittingbourne! 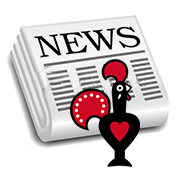 Read more about Nando's to open in Sittingbourne!